Nets of Rectangular Prisms: The surface area of an object is the number of square units needed to cover all of the surfaces of that object. Let's pull this prism apart to see what surfaces we need to cover! Pull the sliders to pull the surfaces of our rectangular prism apart. After you pull the surfaces completely apart, use the results to answer the questions below. Question 1: What shapes are faces of our rectangular prism? Question 2: By pulling this prism apart, have we changed the amount of square units needed to cover these faces? 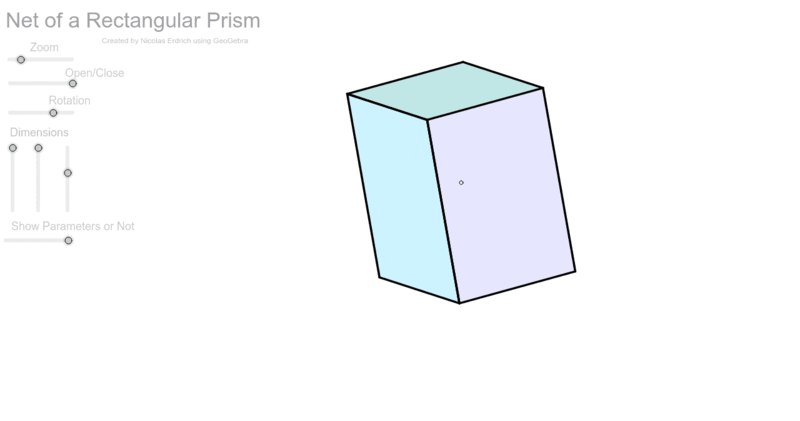 Question 3: How are the area of the "net" on the right and the surface area of our prism related? Question 4: Describe a plan for finding the surface area of our rectangular prism.